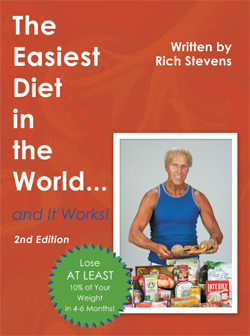 3)ORDER THE BOOK & ASK QUESTIONS OF RICH & HIS "LIFESTYLE CHANGE"
7)DRAMATIC CHANGES MADE FROM THIS LIFESTYLE CHANGE! 10) THE WAY TO SHED THE POUNDS!! & STILL LOST 30 POUNDS! 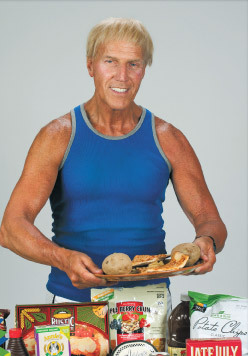 In the spring of 2007 I sought out to lose 5-15 pounds, and even harder an inch or two off my waist, and especially hard I wanted to lose my love handles! I did not take any "Before" photos of myself as I didn't know what to expect. The results from going to my new "diet", or as I properly call it here in this book my new "lifestyle", were astonishing to say the least! Within four months I lost 30 pounds, 4" off my waist, and the love handles are gone! And it was so easy!! I eat anything I want: ice cream (boy do I love ice cream! ), candies, cookies, cakes, sugars, starches, pasta, pizza, potatoes...You name it!! I would not change from this new lifestyle for any amount of money. It has gotten me "looks" from everyone and higher self-esteem, but also it has made my cholesterol drop from 229 to a good normal 175 and normal on both the good and bad types. Also formerly I was taking one high blood pressure pill every night and now my blood pressure is also normal. My triglycerides are an amazing 50 after being over 140! People are amazed at me and how I look, feel, and act. Usually they guess 10-20 years younger than my age! And if YOU follow all the ideas of this book, you will also make incredible improvements on your looks, health, and body and will not ever think of changing from this lifestyle. The Easiest Diet In The World..And It Works!